On one of the days when Robert didn't have to work in the morning we took a walk across the city to the canals and Navigli district of Milan. 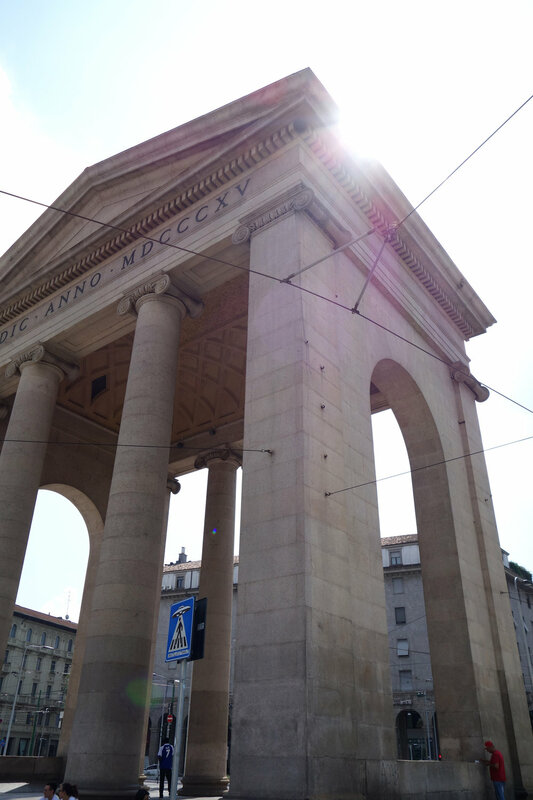 It was a fair walk to the area but it was a great way to see more of Milan and get to grips with the city. We left early enough so it wasn't ridiculously warm but it didn't take long for it to get wonderfully hot (unlike the weather back home which we were told rained pretty much continuously). It did mean that our first priority when we arrived was to find somewhere to grab a cold drink. We stopped into a lovely little cafe where we managed to order a couple of cokes, despite our poor Italian, and got a bowl of crisps thrown in for free. We had a wander around the streets, avoiding the trams, and tried to work out what to do about to do about lunch. There were a number of very large colourful snails dotted around the area adding to the fun, laid-back atmosphere to the place. In my research prior to our travels I found lots of places suggesting that the Navigli area was great for eating out, unfortunately when we got there the places I had earmarked as potential lunch spots were closed (the downside to going to Milan in August when everyone shuts up shop). Luckily there were plenty of spots to try some street food style nibbles which we grabbed for some quick lunch before Robert had to work. Of course before we started on our long walk back to the hotel we had to stop for a quick gelato break. When in Italy I'm pretty sure it's the rule that gelato must be consumed on a near daily basis, that must be a thing...if not then I'm making it a thing. Unfortunately they didn't have sorbet so I just sneaked some tries of Robert's cookie flavour gelato, yummy.